Oral suspension. Fast effective relief. 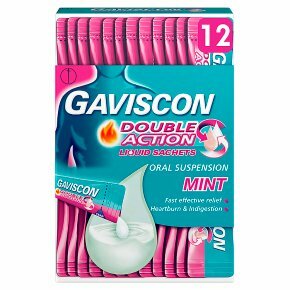 Heartburn & indigestion.Sodium alginate Sodium bicarbonate Calcium carbonate Gaviscon Double Action Liquid Sachets bring fast effective relief from the pain and discomfort of heartburn and acid indigestion. They get to work in two different ways: 1) neutralising excess stomach acid to relieve pain and discomfort. 2) forming a protective barrier over the stomach contents to soothe the burning pain in your chest. Dosage: For oral use. Adults and children 12 years and over: One to two 10 ml sachets after meals and at bedtime, up to four times a day. Children under 12 years: Should only be taken on medical advice. If symptoms persist after 7 days consult your doctor. KEEP OUT OF THE REACH AND SIGHT OF CHILDREN.<br><br>Do not use this medicine after the expiry date (EXP: month/year) shown.